In this post I have shown here my some of previous published posts in chronological order.Let us discuss them one by one. Here I shall show how square of 35 can be found quickly. then place 25 as last two digits (i. e Right most ) of the result. 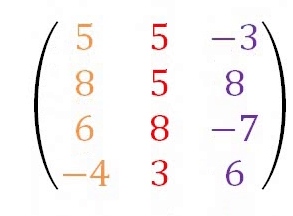 Take the digit which is on the unit's place and multiply it with its successor (next digit from it), Here in this case the 1st two digits are 12, the product of 3 and its successor 4. 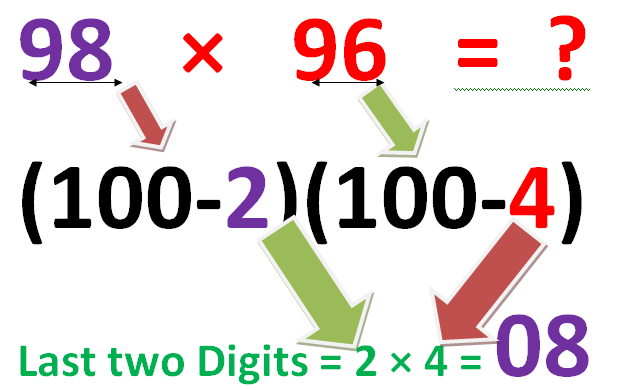 How to find the multiplication using short cut Method 52324 × 11= ? More Examples like 92 × 91 = ? A Matrix is a set of elements ( Numbers ) arranged in a particular numbers of Rows and columns in a rectangular table. Matrices inside parentheses ( ) or brackets [ ] is the matrix notation. Here we have an examples of Matrices . The elements which are written in horizontal lines are called Row and elements which are written in Vertical lines are called Column. In the matrix A above ↑ the elements 5, 3, -2 are written in Row wise whereas the elements 5,4,3 are written columns wise, Similarly the elements 4,-1,7 are written in Row wise whereas the elements 3,-1,4 are written columns wise . [ -1 ] Matrix has 1×1 order. And the matrices A,B,C and D above have 3×3 ,2 ×2 , 3×4 and 3×2 respectively, as Matrix A has 3 rows and 3 columns, matrix B has 2 rows and 2 columns, Matrix C has 3 Rows and 4 Columns Similarly Matrix D has 3 rows and 2 columns. Before multiplication of two matrices we have to check whether multiplication is possible or not , If it is possible then matrices will be multiplied to each other. Necessary condition for multiplication of two matrices is if " The number of columns in the first matrix is the same as the number of rows in the second matrix ". We must know different types of matrices ,Rows and Column. Note : The commutation may or may not be possible for multiplication of matrices, That is in some case AB = BA but In general AB is not equal to BA. 1. Multiplication of 2 × 3 matrix with 3 × 4 matrix is possible as number of columns in 1st Matrix is equal to numbers of rows in 2nd Matrix and Resultant matrix will be of 2 × 4 order . 2. Multiplication of 5 × 1 matrix with 1 × 2 matrix is also possible as it gives 5× 2 matrix as resultant Matrix. 3. Multiplication of 4 ×3 matrix with 2 × 3 matrix is NOT possible. Because red colour numbers 3 and 2 do not match . As we know the Ad joint Matrix of any matrix can be found by taking the transpose of the Co Factor matrix. Let us take one example to Multiply 2×3 and 3×2 Matrices ,The order of resultant matrix will be 2 × 2. In this post I have discussed some of my post published earlier in chronological order . If this post helped you little bit, then please share it with your friends to benefit them, comment your views on it and also like this post to boost me and to do better, and also follow me on my Blog .We shell meet in next post till then Bye .